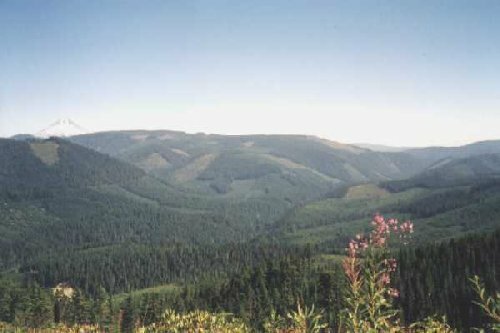 Oak Grove Butte, looking NE up Oak Grove Fork of Clackamas River. Went up to Oak Grove Butte to look at strange rock doings with Cliff and Trapper Steve. Steve drove. It has gotten cooler, so the back seat of Steve's pick-up wasn't so bad. It was further up to the "camp fire circle" ( see September 7, 1999) than I had remembered. Also, going up the washboard on the road seemed a little more tiresome than when I went downhill. After looking the place over, both Steve and Cliff were perplexed. It was just as bizarre as I had described. Steve called it: "The people baiting site." 9/99 Rock yanked vertically from hard ground. Oak Grove Butte. 2 3/4" shotgun shells (grouse season). Rock not found. Joe Beelart. We went on to where the rock was pulled from the ground. It too was just as I described it to them. The edges of the hole were still crisp and showed no finger marks, pry bar work or cable pulling. It was just yanked out of the ground and tossed somewhere. Both Steve and Cliff looked for it, but couldn't find it both up slope and down. They did find some more smaller holes. 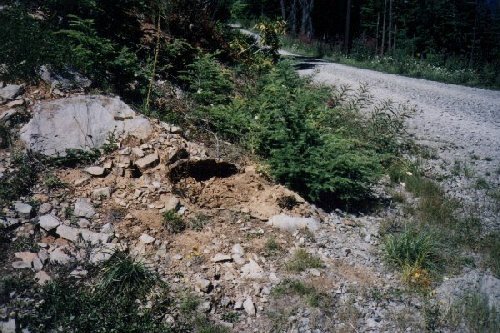 The stones from them were found 20'-40' away, not the small roll out that bears do it. The hole was trapezoidal, almost rectangular toward the top ½. The hole was 7" deep to the dirt level. 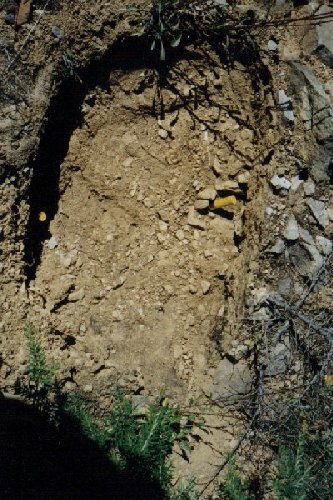 Most of the similar rocks in the area stood out of the ground 1"-3" more. The sides of the trapezoid were about 18" long and the top was 26." The bottom, the small end, was 13" plus. Later, I calculated the size of my sample and established a density per square inch. The absolute minimum the pulled rock would weigh was somewhat over 200#, probably more like 250# plus. We turned back and went up the road that leads to the top of Oak Grove Butte. About a mile short of the top, a tree had fallen across the road. It was about an 18" plus straight fir. Cliff spied on it a very pretty pile of small stones made into a pyramid. The pile was about 4" high and 6" in diameter. They were tightly stacked. 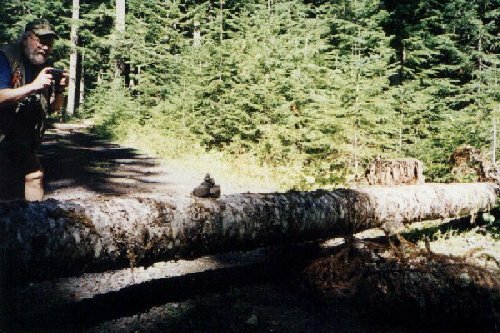 There was no evidence of someone sitting on the log stacking them. We looked for hairs. Again, in the whole area, there was no people litter - none, as in none. There were a couple of tire marks where trucks had turned around, but there were no foot prints on the edges of the road. We took some photos of the pile and then decided to scout the Butte. The top of the Butte is sort of like a saddle. The pommel is on the north and the seat a little lower to the south. Cliff and Steve decided to go to the high part where the infrared reflector was. That was also the area that Cliff had seen his track 20 plus years ago. Neither of them made the top as it turned out. I went up toward the south "summit." It was pleasant under the virgin timber on the way up. The elevation was high enough and there was enough canopy so that there was little brush. There were some fallen trees to navigate around and there was a patch of smaller trees with low limbs to fight through. I suspect that that patch was caused by a lightning strike fire, although that is only a guess. 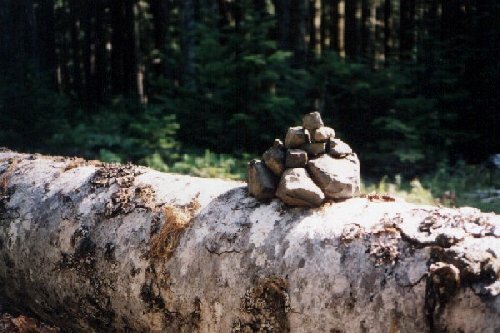 When I got up to the south "summit," I found a nice rock pile. No stacks or anything. Of course, I climbed the few feet to the top of it. I kind of scared myself on the way back down. There were no real landmarks to tell me if the road was east or northeast. It seemed much steeper going down than going up. I was quite afraid I had let myself veer too far south and was going down slope toward the main branch of the Clackamas River. If that was the case, I was in trouble. I kept guiding left and trying to move against the shadows of the trees. After about 45 minutes, guess what I saw right in front of me! The black of Steve's truck shining through the shadows. There were no grouse or any bird up there. Carrying the shotgun up was a waste. On the way back down, we stopped and Steve and Cliff went off looking for a pond that Cliff remembered. I went scouting more to the north. I did find a nice pond made as a result of the road building. All around it were blueberry bushes and they were absolutely full of berries. I ate handfuls, and in about four hours, I really paid for that. I never learn. Flushed a couple of grouse, but no shots in the brush. When the others caught up with me on the road, they reported not finding the old pond and no birds. Despite our never ending efforts to make the Standard Sasquatch Area theory good and our analysis of terrain and findings faultless; today we came up with something new to talk about: "Totally tasteless animal pets." For instance, please visualize them all with a tire track running over a flattened midsection and with bodies such as: "Headlights the Deer (my favorite), Truck Toasted Toad, Race Car Raccoon, Pebbles the Bunny (complete with little rock bumps sewn in), Flat the Cat, and Skids the Squirrel." Combining that with Bigfoot hunting, there was now solid proof that Cliff, Steve and myself have way too much time on our hands. At least Cliff has an excuse, he's retired.